When we came to school, yesterday’s sports day was still on everyone’s minds. We couldn’t stop talking about it! Naturally, we finished our morning jobs first. After that, we gave Nimo a big welcome, as he will be joining our class today and tomorrow. Yay! We gave him a big hug, and sat together with him as he played his ukulele. Some went to the big table to do the color matching buttons. We had other friends who went to the carpet and play with our Play Huts– it reminded us of our obstacle race yesterday. Others were content on sitting in the library while reading their life books. After cleaning up, we all sat down on the carpet, waiting for John– John and his music class. While waiting, we excitedly talked about yesterday’s big event. “What was your favorite part in our sports day?” Pauline asked. “Together with mommy,” X replied. “Balls!” Y said. “Throw the balls,” he told us. We said that it was called tamaire. “I like pull the rope,” W said. She was talking about tug– of– war. “Grandma and grandpa and uncle, they also do tug– of– war!” X said. “Running,” Y replied. “I can run,” he said. “Me too!” Some of our friends said. “Ball pit– so much fun!” Z said. “It’s my sports day… mommy and daddy pull the rope!” XW said. “So much-” Y said, while he mimed crawling complete with sound effects– which he did during yesterday’s obstacle race. “The ball pit, because it had so many balls!” VX said. 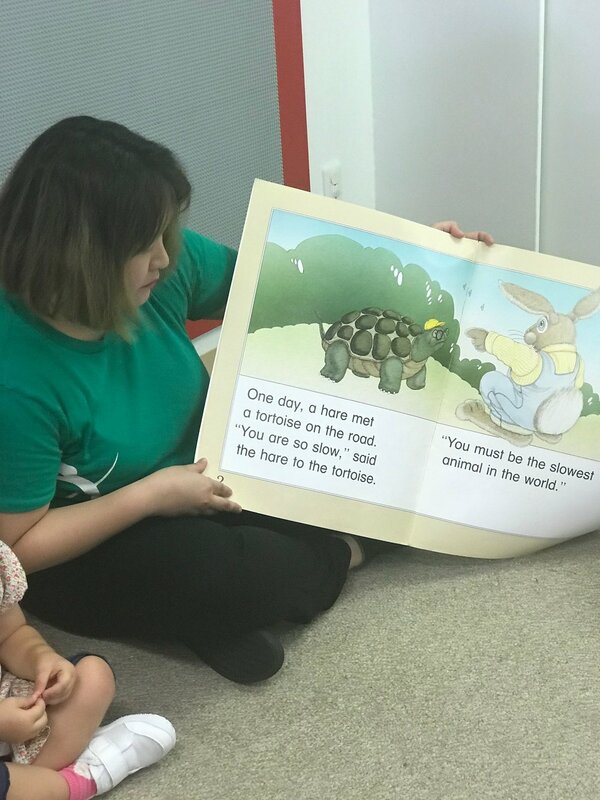 Yesterday’s sports day reminded Pauline of a story called “The Hare and the Tortoise”. Pauline told us that hare was like a rabbit, but much bigger. Kiki told us that a tortoise spends much of his time on land, while a turtle loves to swim in the water. The story begins when the hare told the tortoise, “You are soooo slow! You are the slowest of them all!” and he laughed at the tortoise. At this point, we all agreed that what the hare did was not so nice. The tortoise then said that he was faster than what the hare thinks, which made the hare roll on the ground, laughing. A race was proposed, and the hare thought that it was the easiest race ever. He set off running, but before the finish line, he thought to have a nap, because he assumed that the tortoise will never catch up to him. So off he slept, and the tortoise overtook him, winning the race. The hare was surprised and regretful, so he said sorry and asked if he and the tortoise can be friends. The End. “The hare was sooooo confident!” Pauline said. “Do you know what ‘confident’ means?” she asked. We said no. “’Confident’ means that you can do anything that you want,” Pauline said. “It’s good, but sometimes toooooo much confidence is not good.” Pauline said. “The hare was mean to the tortoise,” Y said. Pauline said that the hare was overly confident and believed that he was the fastest and the best; this made him mean to others. We said that he didn’t follow rule number 1: I respect you, you respect me. Confidence is good, but don’t forget to ALWAYS BE NICE! We then had our music class with John, and he taught us some rhythm exercises while clapping and stomping. We also sang a song about animals in the jungle, and we did animal sounds and actions. We practiced singing our do– re– mi, too. Our day concluded with a good run in the park– we saw Sayaka there, and told her how much we miss her (She will be staying in Flowers Class until tomorrow). How was your day?